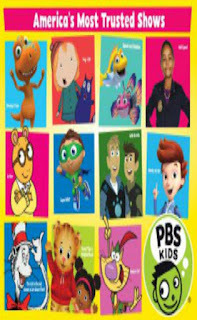 CoffeeWastedMomma: Momma Loves PBS Kids! Are you tired of those annoying "kid" shows? Ya know, the ones that are broadcast to entertain our youngsters. The ones that teach them nothing(good) and come with those catchy little intro theme songs that have your kids...and you hooked from the first 15 seconds. Sure they are animated, loud, fast paced to keep kids watching, but are they learning anything from them. How about the teasing, bullying, laughs at other's expense. Or even down right gross, disgusting and quite disturbing(Sponge Bob comes to mind!). I've seen it all on "kids" shows. As, I'm sure most of us Mommas have. It gets old quickly and very discouraging. We just want good, clean shows that will actual teach our littles and take some of the anxiety off of us to not have to constantly screen and re-screen every 30 minute program they watch. I know I am a big stickler on what my kids watch. We have a list of "banned shows" in my house! It's a real thing people! I'm not ashamed to admit, I need a break! I need 30 minutes of uninterrupted... Me time! I need a HOT coffee that hasn't been reheated 4 times! So, Yes, I use the TV as a babysitter! But, I do want my little to actually be learning something while being entertained! I can honestly say that I have only positive things to say about PBS Kids! Any and all things about them are exactly what I am looking for. They have soooo much to offer. Here is a list of my Top 5 PBS KIDS "momma approved" TV programs! 5. Curious George~ I have to add George. He's super cute and I love the scientist/Doctor parts. They are very good at teaching about making things, baking and using your imagination. It is a great tool to keep kids learning and engaged in a fun, safe way! I hope others will enjoy and help keep this oh so wonderful program alive for many more years to come!